Chakra King of Prussia PA: Your chakra system plays a vital role in your overall health and well-being. Daily stress and tension, past trauma, conflicts and other experiences impact your chakra system. If not resolved, these cause chronic problems. Imbalances, congestion, blockages or dysfunction in one or more of your chakras will impact your life on multiple levels. Maintaining chakra health is essential to overall health and well-being. Wellness in Harmony offers Chakra Clearing services remotely via phone and Skype and near King of Prussia at YogaLife Institute: 860 E. Swedesford Rd. Wayne PA 19087. 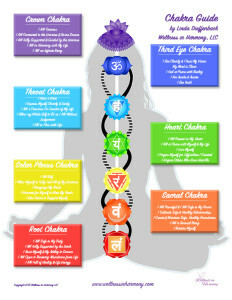 To learn about the Chakra’s and how they work, see our blog. “Emotions are not ‘bad.’ At the roots of our emotions are primal energies which can be put to fruitful use. Indeed…the energies of enlightenment arises from the very same natural origins as those which give rise to our everyday passions and emotions.” – James H. Austin, M.D. Sessions provided by Linda Dieffenbach, trained practitioner of Chakra Clearing with Applied Integration (SM). At the beginning of the session, Linda will guide you through a gentle grounding and relaxation process. You and Linda will then engage in a gentle dialoging session. During this time, you are encouraged to share about the challenges you are facing. Whatever struggles, conflicts or issues you are facing are appropriate to bring forward. As you share, Linda will tune into your chakra system to identify stressed, damaged or imbalanced Chakras associated with the challenge you are experiencing. From this point forward, the underlying root cause of the imbalance will be identified. You will then be guided through a process to clear the affected chakra(s). You will develop practical life skills and energetic self-care tools that help you improve the health of your chakra(s). At the end of the session, you will receive integration tools to use to continue healing and strengthening your chakra system.